Los Angeles: Hundreds of pro-Kobani activists marched on in Westwood, Los Angeles to condemn the Islamic State (IS) and their murderous onslaught against Kurds, saying that they will continue their protest against IS terrorism in Kobani. Improvised signs were being made by women activists as more protesters joined the demonstration. The statement issued by the Kurdish community, as one of the main organizers of the event, read: “We stand in solidarity with the people of the besieged Kobani and call for prompt action to save the residents and defenders of the city from a massacre. The IS terrorists have captured sizeable portions of the city despite the fierce and heroic resistance of Kurdish freedom fighters. Hundreds of people have died and over 200,000 people have been driven away from their homes, stranded in border areas, their fields ravaged, their belongings plundered, and their children traumatized. Many are mourning the loss of their loved ones, their homes, and their land. Mehdi Keshavrz, one of the organizers, commenting on the presence of a large crowd, noted: “This reveals that Kobani people and its defenders are not alone.” Many of the attendees were non-Kurdish. They came from different ethnic backgrounds – Armenians, Iranians, Assyrians, and Americans, to denounce both IS and the Turkish complicity in the relentless onslaught on the city. 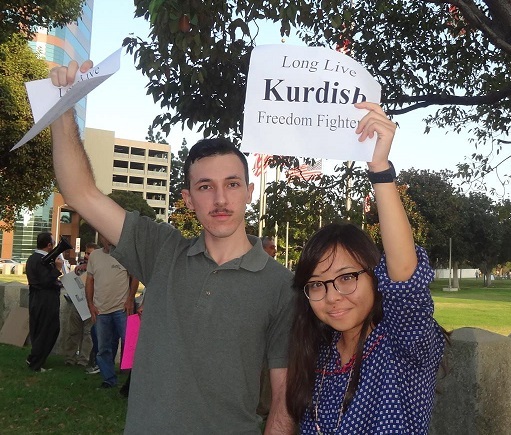 Joe Smith, an American, wanted to hold a sign that said “IS kills, Turkey supports”, arguing that despite US late support, Turkey still insists on seeing the obliteration of Kurds. “This is a hypocritical position which is more pro IS than even NATO. NATO should kick Turkey out.” Berry Anderson said: “The Islamic State has singled out Kurds to be obliterated as Hitler did to Jews in Germany. I do not know why the world cannot see this and stands idle.” Babak insisted that: “…the struggle against IS is symbolic. Its victory will make them more aggressive everywhere else.” Demonstrators chanted: “Long Live Kobani!” “IS kills and Turkey supports!” Sam, a Kurdish American student said: “Unless we take action immediately, the terrifying situation gets worse.” Soraya Fallah, a woman activist, applauded Kurdish women’s units in guiding decisive battles against IS in many fronts. The demonstrators asked for more military aid and support for the Kurds who are the only force resisting the IS. The protestors denounced Turkey for its complicity in recent developments and its support for IS; the protestors sharply condemned Turkey for its ruthless suppression of pro Kobani demonstrations in Turkey. Murad from Diyarbakir said: “IS is doing the Turkish bidding and ugly mission. In the same way they organized Hezbollah inside Turkey to attack us, they have given it a free reign to get rid of us on the other side of the border”. A 70 year old Armenian man, deeply moved by the tragedy, held a placard stating: “Shingal and Kobani, the human tragedy” and said “This is what happened to us in the midst of silence and inaction of the world.” Armenians had an active presence on the protest. “What we see now shows that Turkey has not changed a bit,” Alexis said. The demonstration ended with the Kurdish national anthem and a reassertion of commitment to continue the struggle against Islamic State and its supporters. The protesters in admiring the courage of the defenders of the city called for more concerted international action against IS to free Kurdistan and the Middle East from it murderous and monstrous ideology.